Freechoice: Explore an important part of Prague’s history and uncover its communist-era heritage; follow this up with a beer tasting. Alternatively, visit the impressive Sternberg Palace, which houses splendid medieval and Renaissance works of art that span five centuries, including an exceptional collection of arms and armour. Freechoice: Marvel at the opulence of Warsaw’s Royal Castle, or visit the Warsaw Uprising Museum for an interesting insight into this part of Polish history. 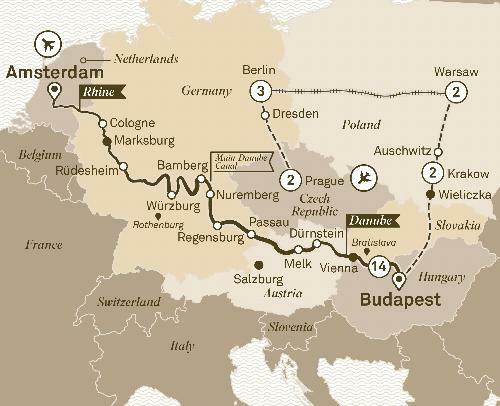 mmerse yourself in tales old and new on a 24 day journey from Prague to Amsterdam. Learn about the history and culture of Europe's most alluring cities.